That Chicken makes my mouth water! It looks so good. Hi Kirk - it's all about the skin. Cooked this way, it doesn't end up crispy, but it is rich, succulent and delicious. Mike, how did you about my shameful neglect of my smoker? ;-) That chicken looks awesome. I think I'll dust off the smoker this weekend and smoke some chicken for the Mister. 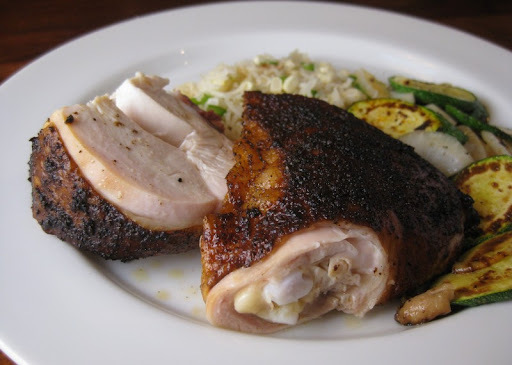 Do you think removing the chicken a little early and then finishing off under the broiler, maybe 5-10 minutes, might crisp up the chicken without drying out the meat? Great! I might give it a try but I kind of like soft skin too. I'll let you how it turns out. 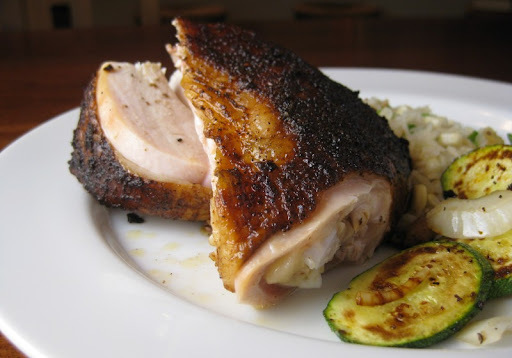 Hot smoked chicken is indeed awesome and convenient. 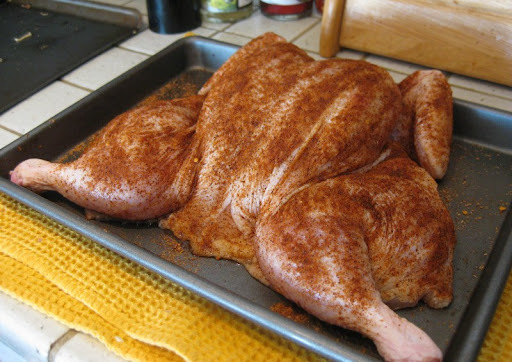 I dry-brine my chicken overnight (rubbing it with 1tsp of kosher salt per pound of chicken, as well as the generic bbq spices) and cook it on my Weber grill over indirect heat with a chunk of cherrywood or applewood on the coals. To make things go faster, I cut the chicken in half by cutting out its spine, removing the keel bone, and slicing the thing in half. 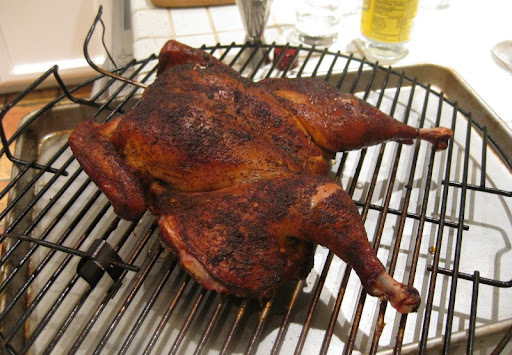 I fire up half a chimney of lump charcoal, dump it in one side of the grill with the wood chunk, put the chickens on the other side, close the bottom vents halfway so the environment doesn't get too hot (the oven thermometer I keep in the grill reads 250-300 usually), and lid it up. I use a digital thermometer that I can stick in the chicken breast and broadcasts to a receiver I can carry around the house that gives me the meat temp. I pull the chicken out when the breast hits 165 or 170 if I'm being cautious. It usually takes 40-50 minutes, and the dry brine seasons the meat right down to the bone.